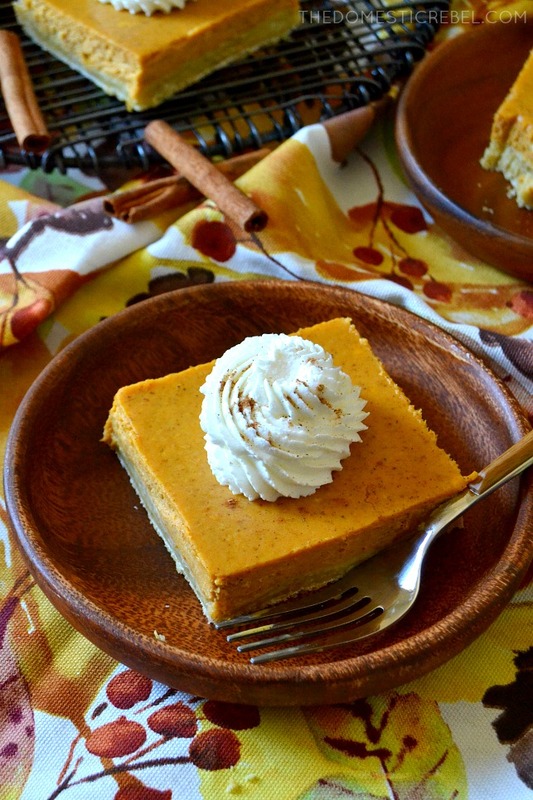 Want a quick and EASY pumpkin recipe that’s sure to impress? 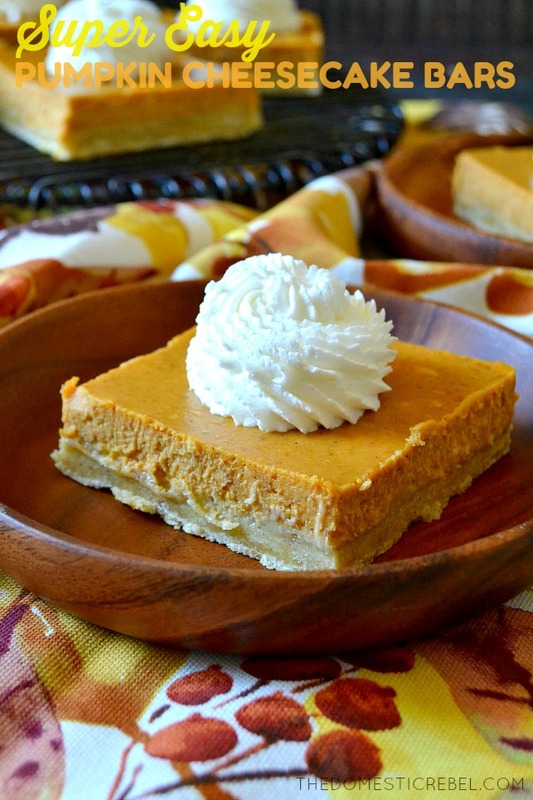 Check out these Super Easy Pumpkin Cheesecake Bars! They come together in a flash and are so irresistible! They taste like a cross between creamy cheesecake and gooey pumpkin pie in a crowd-friendly bar! First pumpkin recipe of the season, say holla! Or don’t, because ‘holla’ makes me feel like I’m 80 and still living in 2005. But we should still celebrate with the first pumpkin recipe of the season, and I know exactly how I’m going to celebrate: by eating all of these bars. I originally posted these (with horrid photos, natch) a few years ago… but when I was fall recipe planning for 2017, I realized I should repost them with bigger, better, awesome-r photos, so here we are! I cannot stress enough how EASY these bars are. They practically make themselves with very little work from you. There’s no water bath. There’s no worrying about ugly cracks in the cheesecake. There’s no fanciness or fussiness. 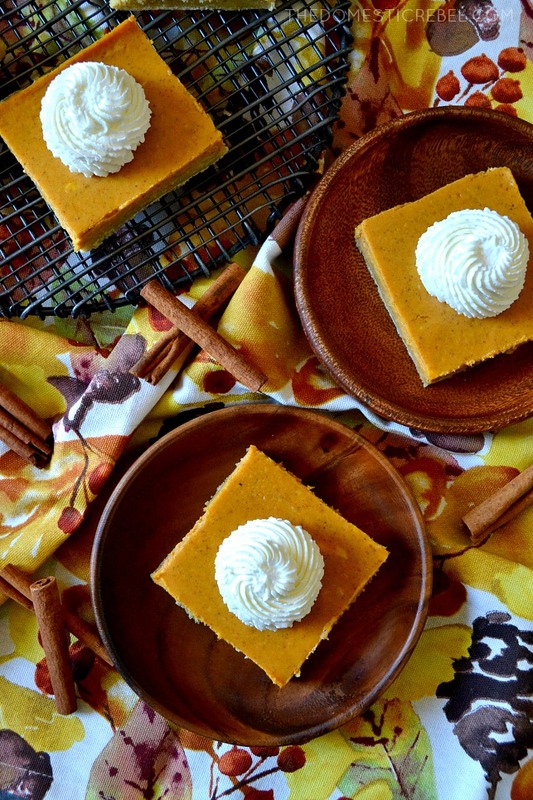 Just mouthwatering Pumpkin Cheesecake Bars. Here’s the low-down: The crust is a box of pound cake mix, which you can find in the cake mix/baking aisle at most grocers. Mix it up with an egg, some butter, and some spices, then press it into your pan. There’s your crust! For the pumpkin filling, it gets even easier: cream up some cream cheese, then mix in pumpkin, sweetened condensed milk, some eggs, and more spice. Once it’s smooth and luscious and practically illegal in all 50 states, pour it over the crust and bake. Badabing, badaboom. Of course, like any pumpkin recipe, the whipped cream on top is not optional. But go crazy once they’re done by drizzling on chocolate or caramel sauces, sprinkling with a little extra cinnamon or nutmeg, or even serving it up with some ice cream (salted caramel, anyone?). But if you’re looking for an easy, impressive dessert that’s sure to please a crowd, you’ve got to give these bars a try! 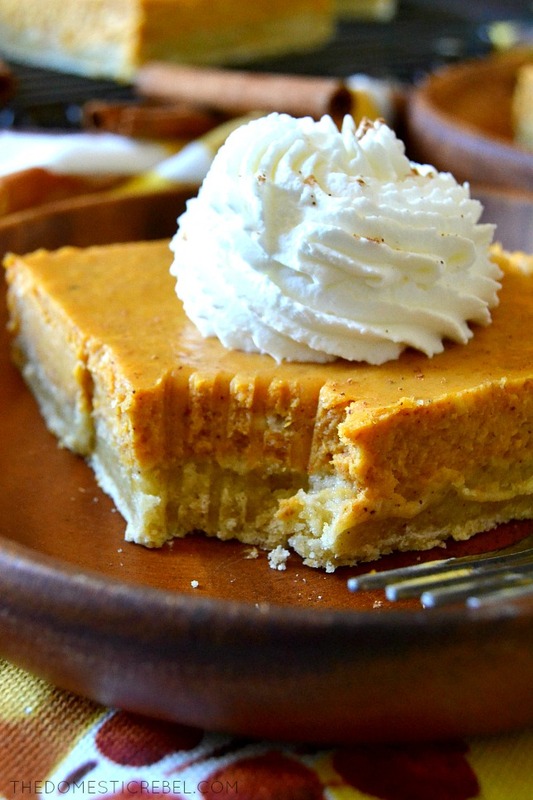 These Pumpkin Cheesecake Bars are practically no-fail and SO EASY. The crust and filling comes together quickly, resulting in a gooey, perfect cheesecake bar that tastes just like pumpkin pie! Preheat your oven to 350 degrees F. Liberally grease a 13x9" rectangular baking pan with cooking spray; set aside briefly. In a large bowl, combine the crust ingredients until moist crumbs form. Press the crust mixture evenly on the bottom of the pan. Set aside. In a large bowl, beat the cream cheese with an electric mixer until fluffy, about 1 minutes. Add in the condensed milk, pumpkin puree, eggs, and spice and beat slowly until smooth and incorporated. Pour the filling mixture over the crust and bake for 30-35 minutes or until the center is set and not jiggly. Cool the bars in the pan until room temperature, then refrigerate for at least 2 hours to firm up before cutting into bars. Garnish with whipped cream before serving. 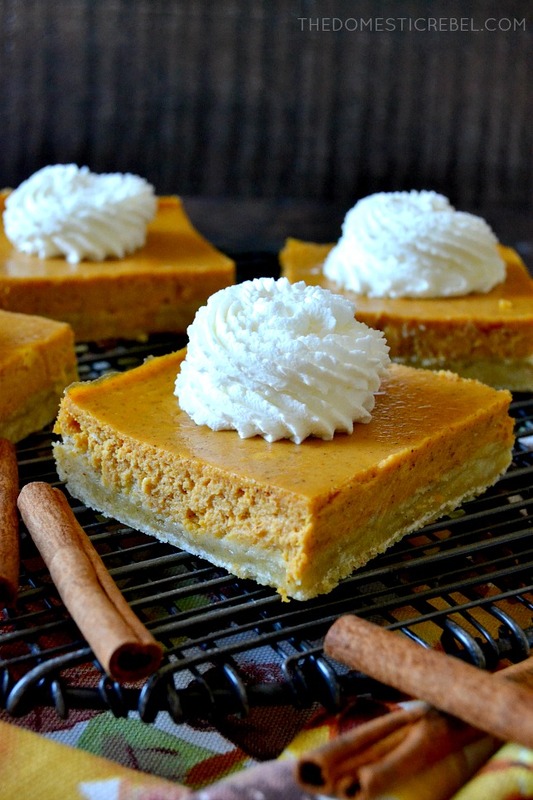 Creamy, perfectly spiced, and ultra pumpkin-y bars that are a show-stopper! You’ve got to give these a whirl! I don’t have pound cake mix but do have a yellow cake mix on hand. Will that work? Thanks! I had a sudden epiphany and used chocolate cake mix. It was yummy!